The St James Residence is a brand new apartment which has undergone extensive refurbishment to make it one of the most stylish and luxurious apartments in the City. 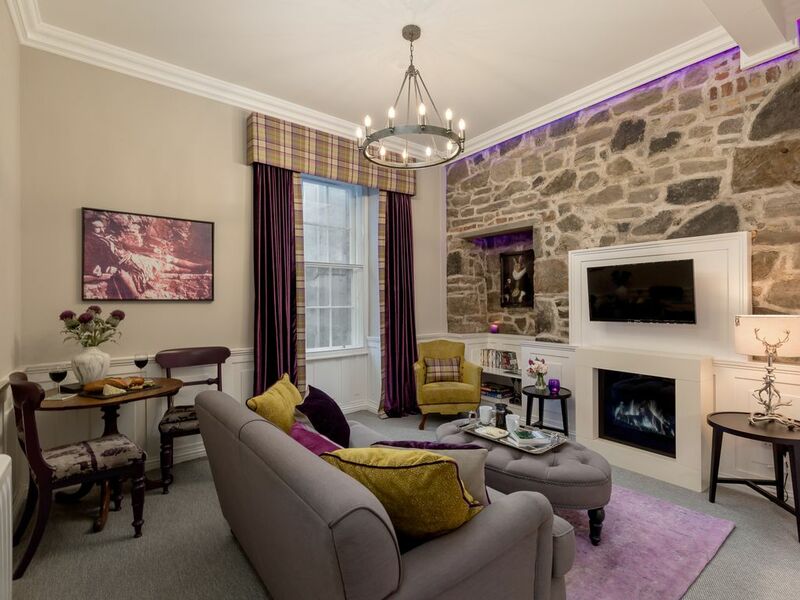 It has all plush furnishings and is located in the most central place possible - less than a 30 second walk to the world famous Princes Street. It has everything you need to have the best stay in Edinburgh - with kind size bed, dishwasher, washer/dryer, and comes with Scottish complimentary toiletries. 15 Calton Road, Edinburgh, EH8 8DL There is a small car park very near the St James Residence. It holds about 10 spaces and nearly always has one or two spaces available. The price is £12 for 24 hours. Q-Park OMNI, Edinburgh, EH1 3AN The car park is close to both properties and also many facilities such as the OMNI Centre, St James Shopping Centre and the Edinburgh Playhouse. The price is £18.50 for 24 hours. St. James Car Park, Edinburgh, EH1 3WW The car park is very central and within a short walk of both properties. The price is £15.20 for 24 hours. parkonmydrive.com Previous guests have rented a parking space via sites such as parkonmydrive.com. Free Parking As you leave town, the parking becomes free. The closest streets that have free parking are off Leith Walk such as Albert Street, Buchanan Street, Iona Street, Dalmeny Street. Firstly the good things. Fantastic location and generally clean and tidy with acceptable furnishings and equipment. However a few minor things could make it so much better. For instance tea towels and larger glasses in the kitchen (no beer glasses!) are needed and most importantly we don't want to see cupboards full of previous guests left over food especially when packets have been opened and some are past their use by date ( weetabix and peanut butter in particular). The fan on the oven appears not to work and needs checking. In the washing machine cupboard there were also somebody else's clothes ! Unusual not to have been provided with some milk in the fridge on arrival. We go away every Christmas and this is the first flat we have ever stayed in that did not have any Christmas decorations! Last year we stayed in the same block in another flat which was superb. Water pressure in the flat is good but the shower is little more than a mild trickle and not great. All relatively minor issues, apart from the shower and oven, but when you add them all up it becomes a little disappointing. Edinburgh at Christmas as always absolutely superb ! The only reason I haven’t given 5 starts on our first night there was a distinctive smell of cannabis in the bathroom and hallway, we assumed this must have been the neighbors. Also on our last morning there was lots of banging going on either above or next to us from 6.30am. We enjoyed our stay very much. Location was excellent, so convenient for the station and major attractions. Apartment worked well for the most part. Bathroom clean and efficient but cramped - nowhere to put anything and no waste bin. An extra shelf would be very helpful. Washing machine worked well. Kitchen also fine but small, a few extras would be welcome e.g. milk jug, sugar bowl and butter dish. We always seem to be slow to figure out how everything works, such as TV, heating and fireplace, displaying the book of instructions in the hall might help. Overall a very pleasant stay, thank you. Great location! Nice and clean! Nicely updated property. Nice shower, bathroom and kitchen areas. Warm and cozy bedding. Location is steps from sights. Parking is an issue at 18£ per day, but Melanie told us where to look for a free zone. We were able to find a spot and park the car there for our 3 day visit. It was a 20 minute walk, but it saved us a bit of money. Apartment was very clean and just as pictured. Bed was comfortable and the bedroom was quiet despite facing a busy road. Kitchen was fully equipped and generously supplied with all cooking needs. The laundry machine was a bonus, though a little confusing to operate if one is not familiar with this type of apartment washer/dryer. The apartment is well designed and beautifully decorated. A good assortment of tourist guides and information was present. The apartment is an easy walk up one flight stairs. The place was very secure and safe. The apartment is a 10 minute walk to Waverly Station, the central rail depot for Edinburg and an easy walk to the Royal Mile. We walked everywhere! Would definately recommend this apartment and would stay again. The unit was exactly as pictured, spotless and comfortable. The location was fantastic as we were able to walk everywhere we wanted. It is conveniently located near the historic district. Very easy to grab meals nearby if pressed for time. For breakfast, two doors away is Cafe Fresco that has wonderful espresso drinks and breakfast sandwiches and Starbucks is only four doors away. Had a simple Italian dinner at Martones and a very good lunch of soup and sandwich at Pep & Fodder. Melanie was very responsive to our VRBO questions. We highly recommend this unit if you plan to visit historic Edinburgh.